The most important question: how much does it cost to visit Bhutan? In order to protect Bhutan's traditional culture and natural environment, the Royal Government has established a daily tourist tariff. 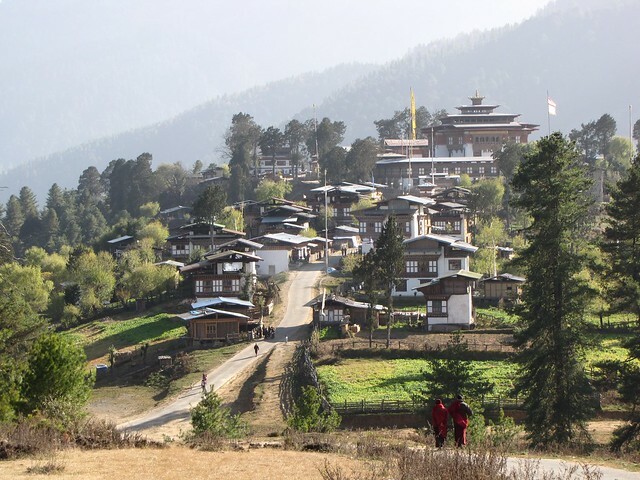 Visiting Bhutan is a "high value, low volume" experience. The total fee must be paid in U.S. dollars prior to arrival in Bhutan. Once you decide to book with Golden Sky Adventure, we will send you our banking information so that you can safely make a wire transfer directly to the Department of Tourism for the tour fee. Note: The daily tariff does not include the cost of any flights or the USD $20 entry visa fee. - There is no charge for CHILDREN up to the age of 5 years. However, children between the ages of 6-12 years accompanied by elders/guardians are given a 50% discount on daily rates and a 100% discount on the Royalty. - Full time STUDENTS below the age of 25 years holding valid identity cards from their academic institutions shall also be given a 25% discount on daily rates. - A discount of 50% on daily rates shall be given to one person in a group of 11 to 15 people. 100% discount shall be given to one member in a group exceeding 16 persons. - 50% discount on Royalty shall be provided after the 8th night and 100% discount on Royalty shall be provided after the 14th night (does not apply to children and student discounted travellers). Travellers interested in visiting Bhutan always get a shock when they see that daily cost. But consider that this will be your total cost to visit (personal shopping, alcohol and donations or tips will be your only spending out of pocket). Think about how much you might actually spend per day at another destination to cover your hotel rooms, all transportation between towns and also at each stop, all meals, a knowledgable and dedicated personal guide plus the cost of visiting sites. You are also contributing $65 per day directly to fund Bhutan's free education and health care programs. Your visit provides financial support to the whole population in an important way and you can feel good about that.